There is gold plating along the entire spine and tang. The file work is extremely deep. The dramatic reverse etch on the straight razor blade provides a satin like backdrop for a stunning, gold coat-of-arms. 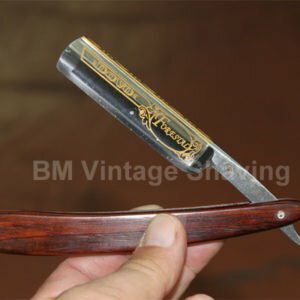 This 5/8 carbon steel Dovo straight razor is a truly distinctive straight razor. 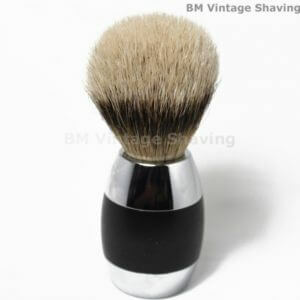 The straight razor handle is simple but elegant made out of highly polished genuine buffalo horn. The natural patterns of the horn ensure a one-of-a-kind finish, hand-polished to perfection. This straight razor Blade is full hollow ground. The treatment of the blade, spine, and tang are exquisite and include custom file work, gold wash, and a reverse etching. There is gold plating along the entire spine and tang. The file work is extremely deep. The dramatic reverse etch on the straight razor blade provides a satin like backdrop for a stunning, gold coat-of-arms. 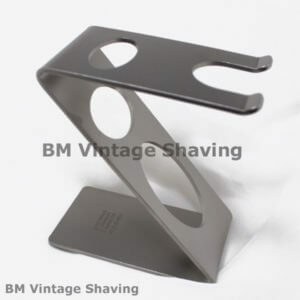 This straight razor finishing also includes Dovo brand stamping and etching on the straight razor blade. Result, Its stunning. This Dovo straight razor will provide the finest shave possible for many generations to come. Quality you can count on for a lifetime. Imported directly from Dovo of Solingen, Germany.